Kdo je pravi prijatelj spoznaš šele v nesreči. Včasih doživiš pravo presenečenje. Prav o tem govori tale simpatična štampiljka iz zbirke RSD. Izbrala sem jo za tokratni izziv pri Creative Moment. Kot vedno imamo dva super sponzorja, ki bosta poskrbela, da nagrajenci prejmejo zaslužene nagrade. - napis sem izdelala s pomočjo računalnika in ga izrezala s škarjami. Oh, what a fun cat and mouse, Marjeta! Lovely coloring and I adore the CAS card design. Thanks so much for playing along with us in our "Anything Goes with a featured Critter" challenge at 2 Crafty Critter Crazies this month. Wonderful creation and a funny image! Nice colourations, too. I like it! 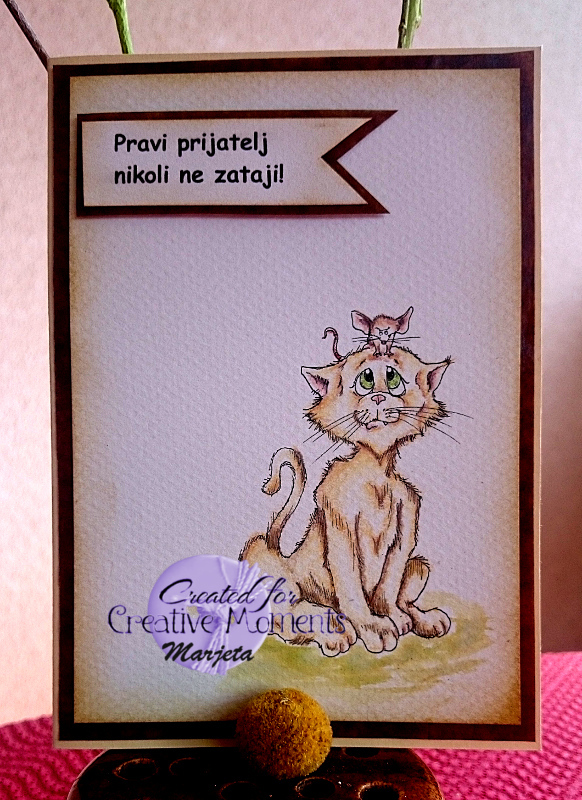 Such a fun image making for a lovely card, many thanks for sharing with us at Stamping Sensations challenge. A super card, such a fun image and great CAS design. Lovely card.......love the image. Thank you so much for joining us at Polkadoodles Digi Choosday and best of luck with your entry.